MidMo Associate Editor Becky Grunewald has been working tirelessly to put together a fun party to kick off the First Day of Summer: June 21. She started off with the location: the NEW Bows and Arrows at 1815 19th Street. If you haven’t been- now if the time to go! Bows is not just a boutique any more; it’s a cafe/gallery/hangout with one of the nicest patios in town. 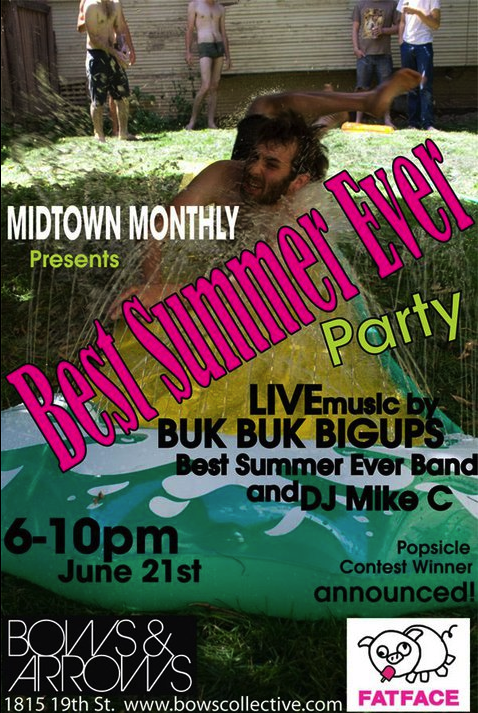 Next, add entertainment: Buk Buk Big Ups will play, as will Amanda Cook’s Best Summer Ever Band. And if that’s not enough- DJ Mike C will spin too! That would be enough for most parties, but Becky wasn’t done! She also worked with FatFace to create a popsicle flavor contest! We’ve been getting entries all month, and tomorrow she’ll announce the winner – and FatFace will have the new popsicle flavor ready at the party! And, if all that isn’t enough we’ll have snacks, drinks, and raffles for special prizes. and best of all- it’s FREE! Hope to see you tomorrow, Tuesday june 21, 6-10PM at Bows and Arrows, 1815 19th Street. Great party! Congrats to Becky, Tim, Liv and whoever else was responsible! I really like what they did to the place. I’ll be checking out the grub at Bows soon and hopefully often as it’s just a block from the orofice.